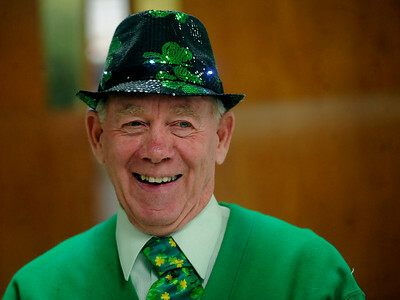 Gregory Shaver for Shaw MediaAla Cain of Johnsburg laughs as he talks with other seniors during the McHenry Senior Service Association’s St. Patrick's Day Party Thursday, March 15, 2018, at the Veterans of Foreign Wars Post 4600 in McHenry. 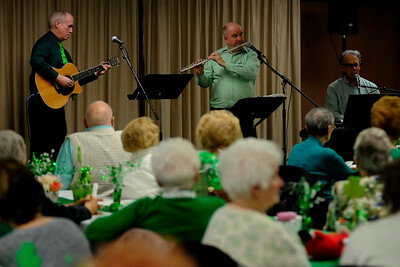 The festivities featured corn beef and cabbage and the Mike Knauf and the Nippersink Rogue Trio performing Irish sing-a-long favorites. 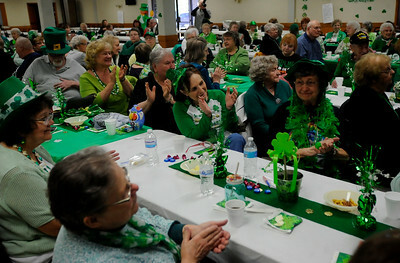 Gregory Shaver for Shaw Media Seniors talk aftger enjoying corn beef and cabbage during the McHenry Senior Service Association’s St. Patrick's Day Party Thursday, March 15, 2018, at the Veterans of Foreign Wars Post 4600 in McHenry. The festivities featured corn beef and cabbage and the Mike Knauf and the Nippersink Rogue Trio performing Irish sing-a-long favorites. 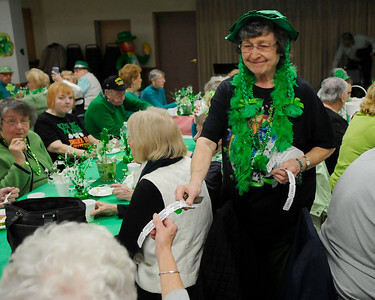 Gregory Shaver for Shaw Media Jane Gregory reads off a rafle ticket winners number during the McHenry Senior Service Association’s St. Patrick's Day Party Thursday, March 15, 2018, at the Veterans of Foreign Wars Post 4600 in McHenry. The festivities featured corn beef and cabbage and the Mike Knauf and the Nippersink Rogue Trio performing Irish sing-a-long favorites. Gregory Shaver for Shaw Media Nancy Felix of Pistakee Highlands sells 50/50 raffle tickets during the McHenry Senior Service Association’s St. Patrick's Day Party Thursday, March 15, 2018, at the Veterans of Foreign Wars Post 4600 in McHenry. The festivities featured corn beef and cabbage and the Mike Knauf and the Nippersink Rogue Trio performing Irish sing-a-long favorites. Gregory Shaver for Shaw Media Bob Hardy of McHenry listens an Irich song performed by the Mike Knauf and the Nippersink Rogue Trio during the McHenry Senior Service Association’s St. Patrick's Day Party Thursday, March 15, 2018, at the Veterans of Foreign Wars Post 4600 in McHenry. 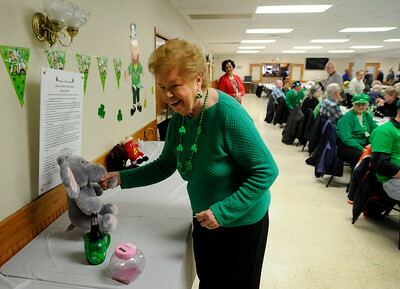 Gregory Shaver for Shaw Media Shirley Klapperich grabs a stuffed elephant after for a raffle prize during the McHenry Senior Service Association’s St. Patrick's Day Party Thursday, March 15, 2018, at the Veterans of Foreign Wars Post 4600 in McHenry. The festivities featured corn beef and cabbage and the Mike Knauf and the Nippersink Rogue Trio performing Irish sing-a-long favorites. 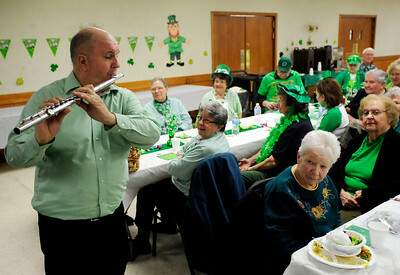 Gregory Shaver for Shaw Media Mike Knauf, of the Mike Knauf and the Nippersink Rogue Trio, performs for seniors during the McHenry Senior Service Association’s St. Patrick's Day Party Thursday, March 15, 2018, at the Veterans of Foreign Wars Post 4600 in McHenry. 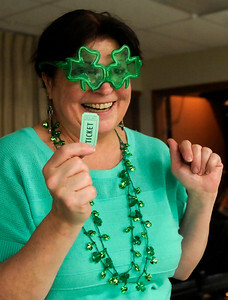 Gregory Shaver for Shaw Media Donna Hamm of Fox Lake celebrates winning the 50/50 raffle during the McHenry Senior Service Association’s St. Patrick's Day Party Thursday, March 15, 2018, at the Veterans of Foreign Wars Post 4600 in McHenry. The festivities featured corn beef and cabbage and the Mike Knauf and the Nippersink Rogue Trio performing Irish sing-a-long favorites. 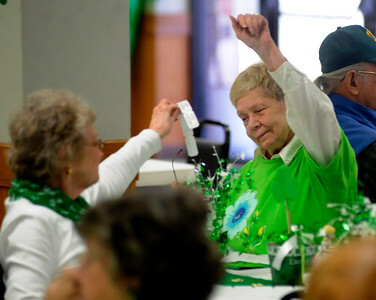 Gregory Shaver for Shaw Media Seniors clap along with the Mike Knauf and the Nippersink Rogue Trio as they perform an Irish song for seniors during the McHenry Senior Service Association’s St. Patrick's Day Party Thursday, March 15, 2018, at the Veterans of Foreign Wars Post 4600 in McHenry. 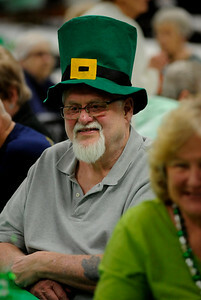 Gregory Shaver for Shaw Media the McHenry Senior Service Association’s St. Patrick's Day Party Thursday, March 15, 2018, at the Veterans of Foreign Wars Post 4600 in McHenry. The festivities feature corn beef and cabbage and the Mike Knauf and the Nippersink Rogue Trio performing Irish sing-a-long favorites. 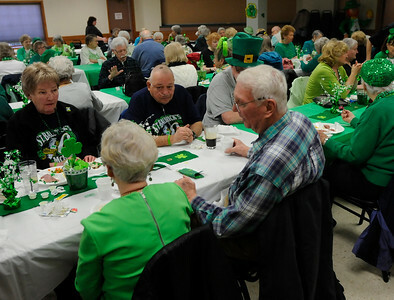 the McHenry Senior Service Association’s St. Patrick's Day Party Thursday, March 15, 2018, at the Veterans of Foreign Wars Post 4600 in McHenry. The festivities feature corn beef and cabbage and the Mike Knauf and the Nippersink Rogue Trio performing Irish sing-a-long favorites.